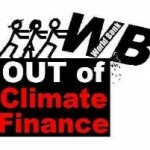 Join the ‘World Bank Out of Climate Finance’ Campaign! - Climate Justice Now!Climate Justice Now! 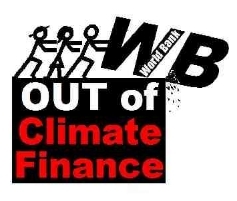 Join the ‘World Bank Out of Climate Finance’ Campaign! Climate change is one of the gravest crises faced by humanity and the earth itself. Unprecedented levels of finance is needed to enable people, communities and nations to deal with present and as well as future impacts of climate change and to make the systemic and technological transformation necessary to prevent worst catastrophes and heal the planet. Many northern country governments and the World Bank itself have been actively pushing for the World Bank to be given the mandate to play a central role in Climate Finance. This is one of the critical issues being debated in the international negotiations taking place now in Cancun, Mexico among governments of more than 190 countries. It will continue to be so in UNFCCC sessions in the near future. The World Bank’s nature as lending institution, its structures, track record and policies, and the ‘development’ paradigm it promotes are in contradiction to the principles of just, fair and effective climate finance. International financial institutions which have contributed to the debt burdens of countries of the South, impose policies that harm people and the environment finance fossil fuel projects that deepen the climate crisis, support private corporations at the expense of public interests, governed by undemocratic structures and operate without full transparency and accountability – these institutions cannot and should not be trusted with climate finance. 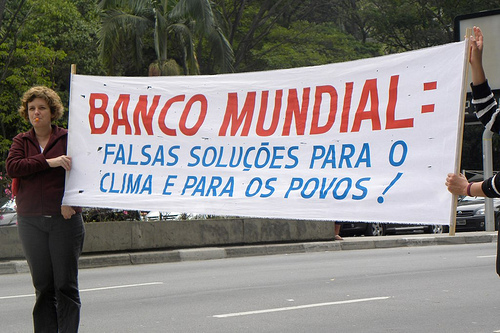 Join us in an international campaign calling for the WORLD BANK OUT OF CLIMATE FINANCE! People and communities throughout the global South need hundreds of billions of dollars each year to deal with the impacts of climate change, build resiliency and adopt alternative development pathways. The cost of compensation for past, present, and future damages due to climate change will only grow if, in addition, the necessary measures, are not taken in the industrialized countries to make a just transition to equitable, non-fossil fuel based economies. We call on the governments of the world to comply with their obligations to ensure that new and additional public resources for climate finance are made available now in a way that is founded on the principle of historical responsibility, does not add to debt burdens, and is free from policy conditionalities. We urge you to set up a Global Climate Fund under the authority of the UNFCCC that has an equitable governance structure, prioritizes the participation of affected communities, operates with full transparency, democracy, participation and accountability, and provides direct access to funding. The World Bank and other multilateral development banks must not be given a role in establishing or governing the new Global Climate Fund nor in managing climate finance. Their nature, structure, track record, and policies, stand in contradiction to what should be the principles of fair and effective climate finance, and the structure and operations of a new fund. The World Bank’s governance structures are undemocratic, with representation dominated by governments of rich, industrialized countries The Global Climate Fund should have a majority representation of South countries in its governance structure since they are the world’s majority and most affected by climate change. The needs and rights of communities impacted by climate change, and the transition to equitable and sustainable economies based on sovereign, democratic control and governance of natural resources must be at the center of decision-making on climate finance. The World Bank has a long track record of undermining human rights and ecological integrity. For example, in 2010 alone, the World Bank financed a record high $6.3 billion to fossil fuel projects, a 138% increase over the previous year. An institution that actively promotes the causes of global warming should not be given a role in global climate finance. Rather, it must be pressed to end such policies and practices, including the many false solutions that the Bank is now promoting. The World Bank actively privileges the private sector and private capital markets over public interests. Climate finance must be used to support the public good, not to promote private profit and the commodification of nature. It must come in the form of public resources, not rely on market-based programs for its generation and application. Innovative tools for raising public resources are already in our reach including redirecting fossil fuel subsidies and military spending, and taxing financial speculation. We call on you, the governments of the world, to keep the World Bank and other multilateral development banks out of the new Global Climate Fund and out of climate finance. 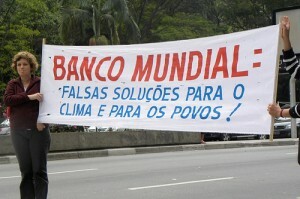 This entry was posted in Cancun / Mobilisations, COP 16 Cancun, Events, Finance, Worldbank out of Climate Campaign by admin. Bookmark the permalink.